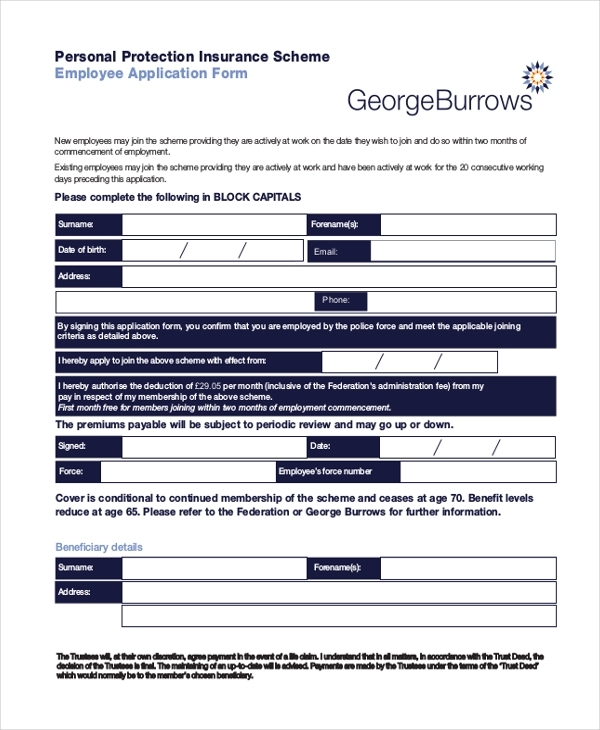 An employee application form is a type of form or sometimes it can simply be defined as an Application Form which often contains a form or a collection of forms for an applicant who wishes to seek employment. 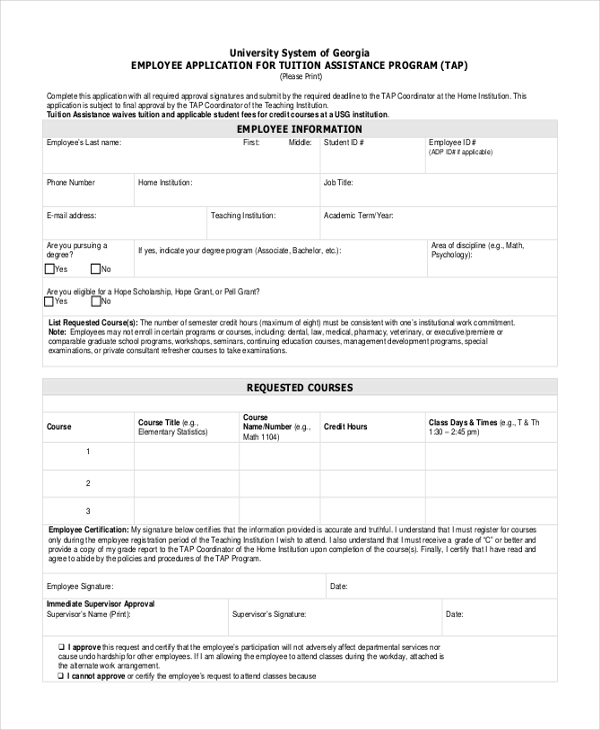 The applicant is required to fill up the form as it is a part of the process to inform the employer regarding the availability of the applicant and to persuade the employer to offer employment to the applicant. An employee registration application form is required to understand the eligibility of the candidate upon whether the candidate is fit for the required post or not. Usually questions that are being asked in the form require specifying the training, experience, skills, behaviour and achievements of the candidate. The basic things that are generally asked in the employee registration application forms are – name, address and contact information, social security number, the type of work and the wages earned by the employer. In order to participate and get registered in the Horse Racing Industry, participants must be licensed or registered to the organization and are required to fill up the stable employee registration application form. Stable employers include the stable hands, forepersons, assistant trainers and racing managers. In the form, an individual needs to furnish personal details such as name, address and contact information, copy document of driving license, passport or birth certificate. A questionnaire is also set up to assess the past record of the individual whether he has completed the mandatory training required for joining in the racing industry or has been barred or refused from obtaining a registration, permit or licence from any Racing Authority. 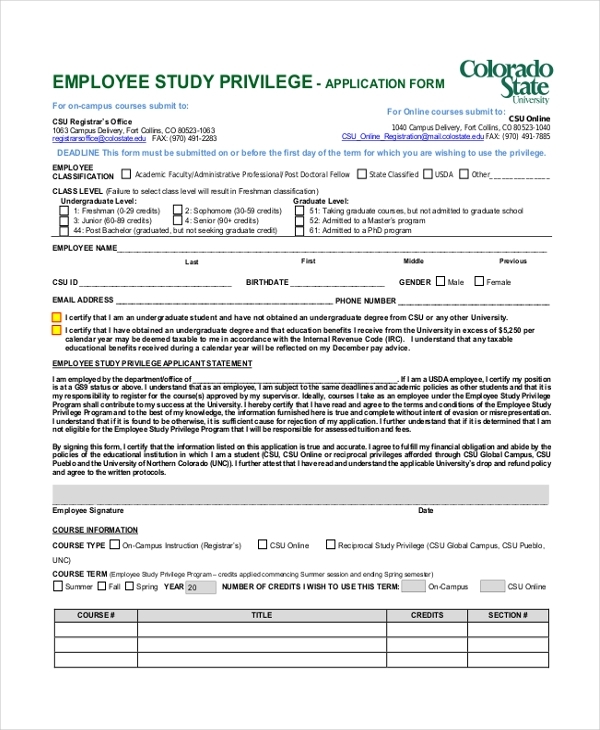 Employee study privilege form is a kind of form which allows a professional working in an organization to pursue higher studies according to his/her post, particularly in the education sector. The form usually asks the candidate about information such as name, address, contact information, employee classification, class level, course information and the duration of the course. 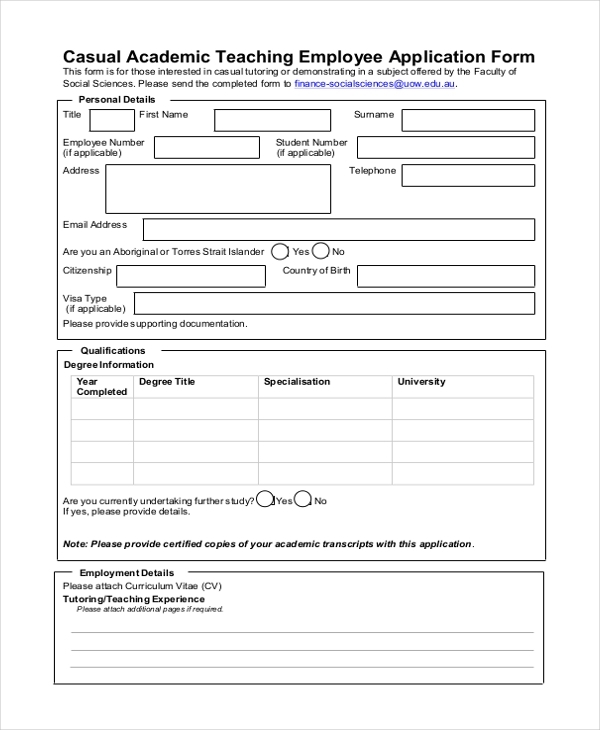 Casual academic teaching employee application form is a type of form which is required to be filled by casual academic teaching employees who are interested in casual tutoring or demonstrating in any particular subject offered by a university. The information that an individual generally needs to endorse in the form is – name, address and contact information, previous qualifications, employment details, past research experiences, tutoring preferences, preferred locations and subject areas and the duration and availability of the individual. Organizations usually provide personal protection insurances to their employees. 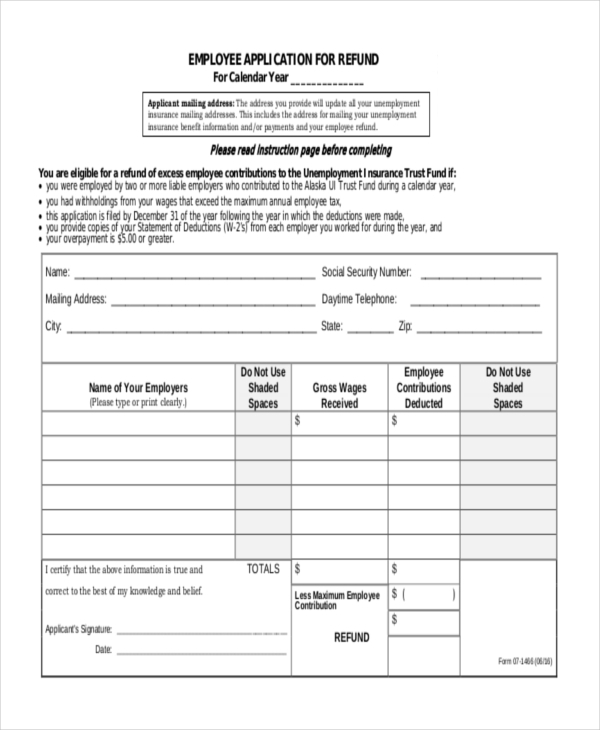 In order to receive the benefits of the insurance, employees are required to fill up the form. The insurance covers the expenses of the employee which include terminal and critical illness, personal accidents, legal expenses etc. An individual has to provide details in the form like, name address, contact information, payroll number of the employee, confirmation of the agreements with a signature, the duration of the premium payable for the insurance and the details of the beneficiaries of the insurance. 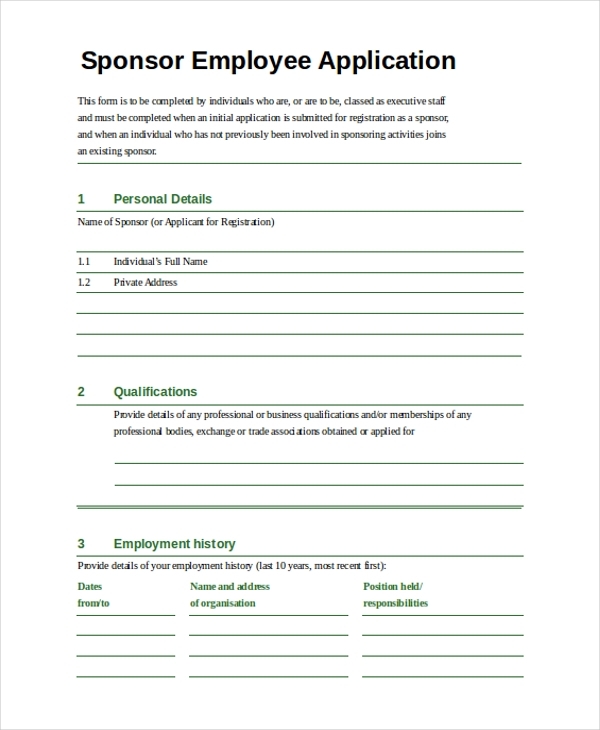 A sponsor employee application is a type of form which has to be filled up by individuals who have completed the initial submission of sponsor registration and should not have previous sponsoring activities. Usually one needs to fill up details like name, address, contact information, qualification and employment history and past experiences of legal or regulatory advice to investment funds or related to any kind of corporate finance. A Confirmation by a Director or Partner of the Sponsor or of the Sponsor Applicant is also required. Employee application form for tuition assistance program is a kind of form which helps working individuals to receive tuition assistance plan. Generally the form asks an individual to furnish details like name, address, contact details, employee id, name of the institution, academic term, requests and details of the degree and approvals from the co-ordinators and supervisors. For obtaining refunds from an unemployment benefit or to receive payments, the employee application form for refund is usually used. General information such as name, address, contact details, name of the employers working under the individual, gross wages received and employee contributions deduction should be mentioned, along with the total amount of the refund. Administrative employee application form is a type of form which is required to be filled by a candidate who wishes to seek job related to the administration. While filling up the form, the candidate has to furnish details like name, address, contact information, social security number, position the candidate seeks for and the salary he/she expects. Educational qualification is also required to be mentioned along with a latest updated CV of the individual. 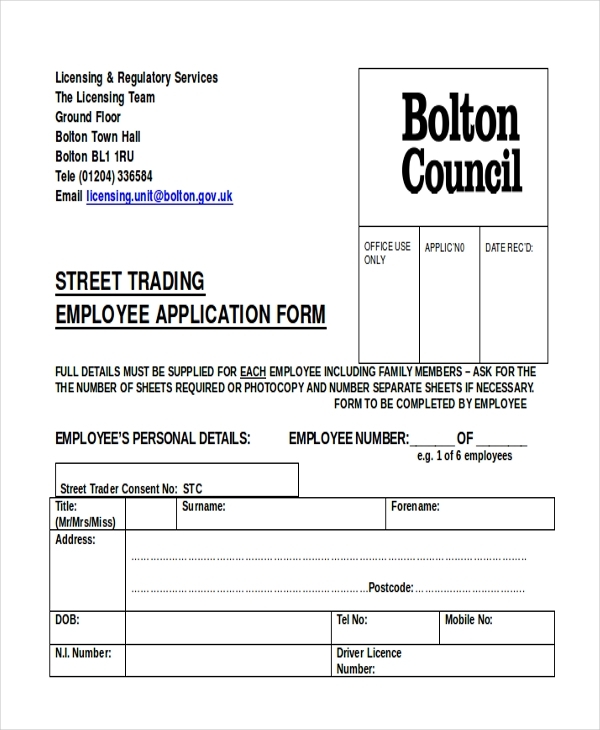 To conduct regular business street trading employee application form is required for an individual. An individual has to furnish his name, contact information, address, declaration of convictions and formal cautions are needed to be stated in the form. 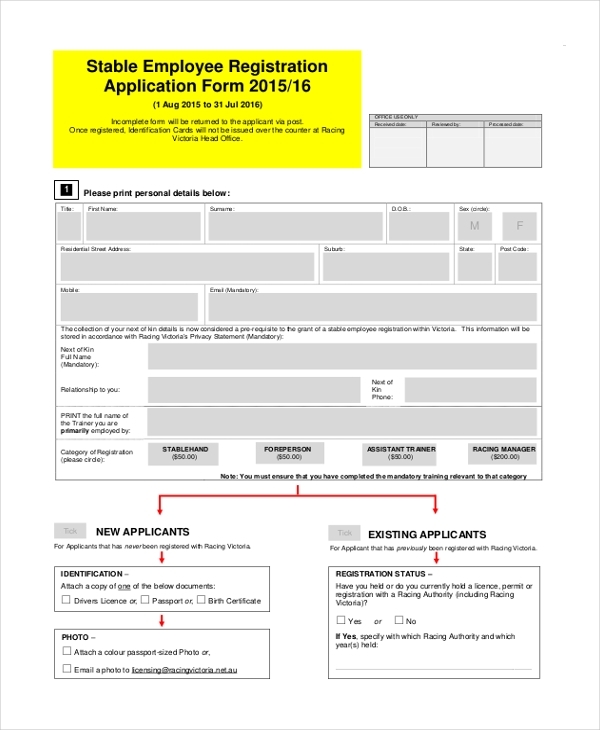 What is an Employee Application Form? The target audience of this particular form is all the people working under an organization. There cannot be any such category of people for this particular form. Every person who wishes to join work or any working organization or is related to some organizations is a target audience. 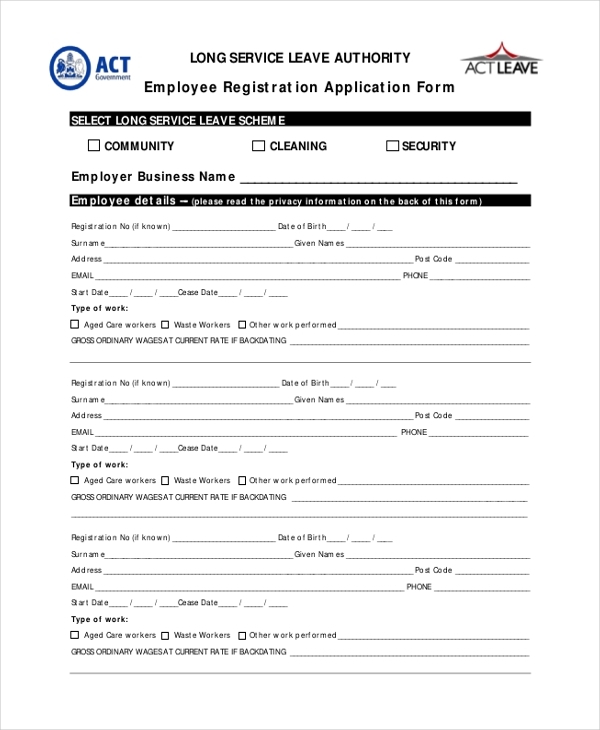 Employee application form can be termed as one of the most essential forms required for an organization. 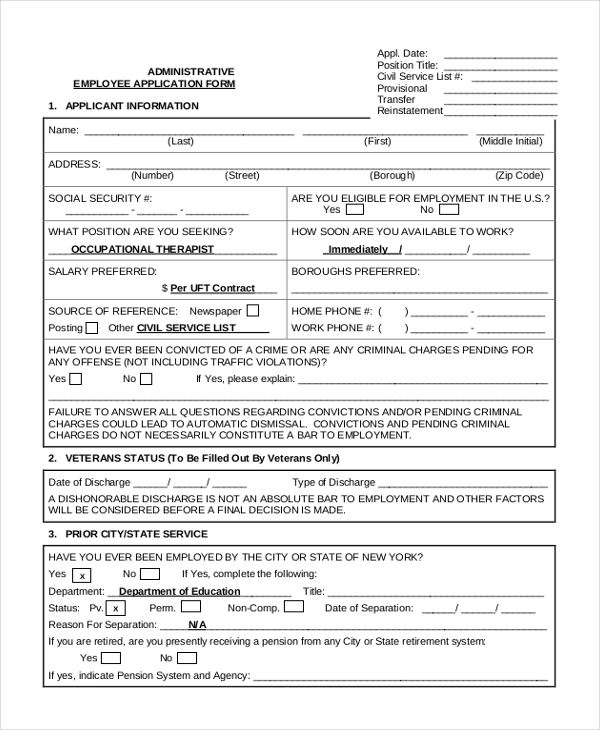 Both the employees as well the employers require to fill the form at a certain point of time.